"What happened to Nefertiti is one of Egypt's greatest mysteries." The Discovery Channel generally comes up with winners when it comes to sneaking an educated and insightful look at the past, whether it be exploring shipwrecks, imagining dinosaurs, or hauling frozen mammoths out of the ice. The lure of ancient Egypt would seem like a good source of mystery, what with the pyramids and mummies and what not, but this overdrawn attempt at creating suspense and wonder as to the final resting place of Nefertiti, the "lost queen," just blathers on and basically overstays its welcome. And the big promise of finally putting a face to Nefertiti, thanks to hi-tech digital facial reconstruction never reaches the appropriate payoff, and that was really the only reason I was hanging around in the first place. It's not that I didn't learn anything. It's just that it took too long to gleam what knowledge I did. Nefertiti, stepmom of King Tutankhamen, wife of power-mad pharaoh Akhenaten, and no slouch in the total control realm herself, also led a big-time religious revolution in Egypt in her heyday (circa 3,000 years ago) and also earned the ire of a fair chunk of the populace. Her final resting place was never certain, and it was even rumored that Nefertiti was actually a rather effeminate male pharaoh who ruled not long after she vanished from the record books. It is because ancient Egyptian history is so fuzzy that the exact whereabouts of a number of characters aren't exactly known, and when a hidden tomb containing three mummies was discovered in the Valley of the Kings in the late 1800s by a French explorer, the whispers of academics hinted that this could possibly be good ol' Nefertiti. The documentary highlights the tedious work of Dr. Joann Fletcher, a likable British Egyptologist whose speciality is the riveting subject of ancient Egyptian hair (! ), and her 13 years of work analyzing a wig, which eventually led to the opportunity to sneak a peak at the dusty mummy trio. See, sounds kind of dry already, doesn't it? The biggest problem are the reenactments, which make up what seem like an inordinate amount of screen time. The very attractive woman who plays Nefertiti spends an awful lot of time slowly looking left or right, while the camera zooms in for a closeup of her eyes, that I guess is supposed to reveal great pools of mystery, but in reality seem like desperate time fillers. That one shot was used at least 459 times (that may be a modest exaggeration), and at one point my daughter Sammi screamed out "Here come the eyes again! Aaaaaaaaaaaaaaaaahhh!" while covering her head with a pillow. I think one of the reasons it was so difficult to get really emotionally into the search for Nefertiti, via this documentary, was that I didn't really care either way if it was her or not. The extended reenactments were a real hinderance, especially when it became clear that they were there for expository padding in between the moderately interesting (and brief) archeological and technical analysis moments. I realize there isn't any archival footage of Nefertiti, being that it was 3,000 years ago, but watching a bunch of actors parade about did not draw me into the narrative history in any way, shape or form. The science of discovery was replaced here by badly acted and speculative recreations. It's true that Fletcher's results are somewhat interesting, but in the end it ultimately all remains fairly inconclusive, and with Nefertiti Resurrected all of the questions could have been answered in a nice, neat 30-minute special, instead of this 98-minute behemoth. 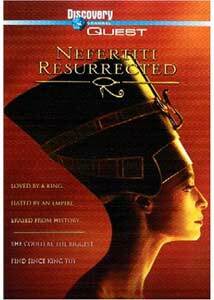 Image Transfer Review: Nefertiti Resurrected is presented in an occasionally pleasing 1.85:1 widescreen transfer, with no real flaws to speak of, save that its not anamorphic. A warm color palette, especially during the numerous reenactments, give off a nice golden hue, which is in direct contrast to some of the dimly lit footage of Joann Fletcher poking around the mummy's chambers. I'm used to DVD releases of cable channel content looking much better than this title does, and my usual comparison is my generally shoddy Comcast signal. This one may be just a marginal improvement over what I'm used to, which isn't saying much. A bit of distracting grain in spots, but a tolerable and slightly disappointing presentation that isn't up to the caliber of other Discovery Channel titles. Audio Transfer Review: Dialogue is what its all about on a documentary, and the 2.0 stereo track is provides fair enough footing to deliver the adequate goods. All of the narration and assorted interviews are clean and audible, with no hiss or crackle, but with minimal imaging or overall flair. Score elements come across full-bodied, as does Tamara Tunie's narration, but the interview segments play comparatively weak. No major complaints, just not a particularly noteworthy effort in the audio department. There are also some photos and text under the Explore the Evidence, which, like the brief Fletcher interviews, offers up a heaping helping of quick and informative facts. Also included are a trio of Discovery Channel television commercials for Nefertiti Resurrected, along with previews of James Cameron's Expedition Bismarck and Quest for the Lost Pharaohs. The disc is cut into twelve chapters, and does feature any subtitles. This is one of those documentaries, from the usually top-notch folks at the Discovery Channel, that could have and should have been condensed down into a more manageable finished product. Like, say, a half hour. As it is, this one really rambles on and reuses what appears to be the same dramatization footage over and over. I swear, if I saw a close up of Nefertiti's eyes, doing one of those Susanna-Hoff-from-The-Bangles eyeball moves one more time, it would be my turn to scream.